I'm assuming that the plot of Jane Eyre is familiar to most of you, but if it isn't, be forewarned that I will allude to certain important details. This book is a treasure, and you wouldn't want me to spoil it, so if you haven't read it, I beg you to stop reading this post right now! The first time I read Jane Eyre was seven or eight years ago. I had just finished up a semester at BYU and was looking forward to some long overdue fun reading. Mike suggested Jane Eyre (believe it or not, it's one of his favorite novels), and I was soon engrossed in the story. But Mike wouldn't let me read in peace. He kept badgering me with questions: "What's happening now? What did you think about that?," etc. etc, until I finally got so fed up, I asked, "Do you just want me to read it to you?" He did, and reading it with him made the plot twists and character development even more enjoyable. I can vividly remember the Saturday morning when we woke up and decided to read a little before we got up for the day. We must not have had anything pressing to get to because we ended up just staying in bed until we had finished the book. When my book club decided to read Jane Eyre, I knew enough time had passed that I wanted to reread it. I'm so glad I did! I was surprised with how much I'd forgotten. Basically, only two things had stuck with me: sweet Helen from Jane's days at boarding school and Mr. Rochester's deranged wife (it's pretty hard to forget something like that even with four pregnancies trying their hardest to wreak havoc on my brain cells). I find it funny that I could so clearly remember where I was when I finished the book, but I could remember absolutely nothing about the ending itself. It was so delightful to get to enjoy all the surprises of the book the first time and then get to enjoy almost all of them again a second time (bless you, pregnancies). The story is told from Jane's point of view, as a sort of memoir or autobiography. She begins with her childhood, dismal and tragic due to being left in the care of her uncle's wife, who cares nothing for her and finds every opportunity to chastise and punish her. Then she is sent away to Lowood (a religious boarding school), and despite its being founded on principles of extreme self-denial, Jane finds it a bright and welcome reprieve. There she meets Helen and Miss Temple, both of whom shape and nurture her in profound ways. When she reaches the age of eighteen, and Helen and Miss Temple are both gone, she realizes Lowood has nothing else to offer her, and she applies for a governess position at far away Thornfield Hall. It is several months before Jane meets the master of the house, Mr. Rochester, and when she does, she is surprised with how easily she forms a friendship with him and how much she enjoys spending time in his company. But Thornfield is full of secrets, and when the floodgates suddenly burst open and Jane discovers all, everything she believes in is threatened, and she discovers just how strong she really is. And now, I'm finding myself at a loss for what to say next. In the midst of my profound love for this book, my thoughts are reduced to, "Jane is awesome. Jane is awesome. Jane is awesome . . . ," but that does little to convey why I admire her character so much. "I was experiencing an ordeal: a hand of fiery iron grasped my vitals. Terrible moment: full of struggle, blackness, burning! Not a human being that ever lived could wish to be loved better than I was loved; and him who thus loved me I absolutely worshipped: and I must renounce love and idol. One drear word comprised my intolerable duty - 'Depart!'" When Mr. Rochester asks, "Is it better to drive a fellow-creature to despair than to transgress a mere human law, no man being injured by the breach?," this reply follows, "This was true: and while he spoke my very conscience and reason turned traitors against me, and charged me with crime in resisting him. They spoke almost as loud as Feeling: and that clamoured wildly. 'Oh, comply!' it said . . . 'Who in the world cares for you?' . . . Still indomitable was the reply: 'I care for myself. The more solitary, the more friendless, the more unsustained I am, the more I will respect myself. I will keep the law given by God; sanctioned by man. I will hold to the principles received by me when I was sane, and not mad--as I am now. Laws and principles are not for the times when there is not temptation: they are for such moments as this . . . "
"I felt veneration for St. John--veneration so strong that its impetus thrust me at once to the point I had so long shunned. I was tempted to cease struggling with him--to rush down the torrent of his will into the gulf of his existence, and there lose my own. I was almost as hard beset by him now as I had been once before, in a different way, by another. I was a fool both times. To have yielded then would have been an error of principle; to have yielded now would have been an error of judgment." I'll try to resist quoting the rest of the book . . . but only with great difficulty. I also think this book was far ahead of its time in expressing feelings of passion and love. As much as I love Jane Austen's novels, you have to admit that there's a lot of beating around the bush in them with pages and pages leading up to a two-sentence declaration of love. Or this one: "No--no--Jane; you must not go. No--I have touched you, heard you, felt the comfort of your presence--the sweetness of your consolation: I cannot give up these joys. I have little left in myself--I must have you . . . My very soul demands you: it will be satisfied, or it will take deadly vengeance on its frame." The fact that I'm sharing so many quotes is a testament to how much I loved this book. I feel compelled to save them somehow so that I can find them easily and quickly in the future. When I read this book for the first time, it quickly climbed to the top of my list of favorites. It stayed there through the years, even as my memory of the plot faded, because of what I remember feeling when I read it. Reading it a second time did not lessen my love for it one whit. I've changed in the years that have passed. My life and circumstances have also changed. But Jane still inspires me. The mystery and passion of the plot still thrill me. And the ending still makes my heart swell with happiness. I think it's safe to say this book will remain a favorite for the rest of my life and that this will not be the last time I read it. I didn't read the post given that I have never read the book and hope to this year (it is on my list). But I did want to take a moment and let you know that when I found your blog a few months ago I stumbled upon your review of Edenbrooke. The is normally not a book I'd ever pick up, but I was intrigued and decided to give it a try. Three days later I am so glad I picked it up. I struggled to put it down, and stayed up until after 1am last night just to finish. It was a bittersweet finish - I loved it, but was so bummed to be done. I'm ready to start it all over again. And I'm looking forward to reading her next book. Jocelyne - I'm so glad you liked it. Blackmoore was equally difficult to put down! :-) Thanks so much for commenting. It is so fun for me to hear from readers who have found this blog! And I hope you enjoy Jane Eyre (although if you don't, maybe don't mention it to me . . . it will break my heart!). I read "Jane Eyre" back in high school and remember really liking it, but I'll have to read it again! Like you, I can't remember much of the plot, but I do remember the feelings I had when I read it — and I love how strong of a heroine Jane is, especially for the time period in which the book was written! 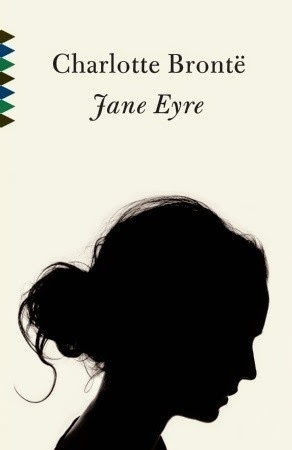 I know I'm in a small minority here, but I do not at all like the book Jane Eyre, mostly because I can't stand Jane as a character. What if she really was the bratty, rebellious child and young woman that her aunt and school master found her to be? It's weird: Wuthering Heights is one of my favorite books, but I somehow feel that Jane Eyre is too dramatic. Google put Doodle for honoring Charlotte Brontë on her 198th Birthday. I'm sooooo reading this one soon. I've already purchased the audio. Pop by and chat about Pride and Prejudice with me. I can't say much about Jane Eyre yet since I haven't read it but I would love to hear your thoughts on P&P. Aww, I love this post. Jane Eyre is one of my favorites, but the last time I read it was 2007. I was planning on treating myself to a re-read next month for my birthday and you've just convinced me.